What I would do to improve the London Stadium! The situation with the owners, the fans, the stadium, E20 and the govt cannot go on as it is. The current deal is abysmal for the tax payer and the deal in return is also poor as WHU have no control whatsoever in the running of the stadium. Compromise and alternative deals need to be struck by all parties named above. In all reality WHU are stuck with the stadium for the foreseeable future,talk of rebuilding a new stadium elsewhere or knocking the stadium down is nonsense and completely unrealistic at this point in time. The billionaire owners/company’s that some crave for are not exactly queuing up around the corner even if the owners wanted to sell up, also the club in its current state is severely lacking in appeal for any prospective buyer anyway so we have to make the best of what we’ve got. Here are my proposals to improve The LS short term within a sustainable and reasonable budget and in doing so will maximise profits long term for both WHU and E20!and help us, the supporters. •If Athletics is to remain then a percentage of the cost of the installation of retractable seating to be paid for by WHU which would make it a proper multi use venue. •£2.5m yearly rent paid by WHU to be raised significantly to a more realistic amount to appease the govt and the tax payer. •Stewarding to be employed and paid for direct by WHU for football games only, all other events eg Rugby/live concerts, athletics etc the stewarding to be provided by E20. •Considerably more say/freedom in the running of the stadium. •Front row seating to be “squared off” if possible. •Capacity to be extended to 66k and more toilets installed to cater for extra fans. •A bigger share of catering profits, a bigger capacity stadium will offset the loss of income to the LLDC, more fans means more profit! 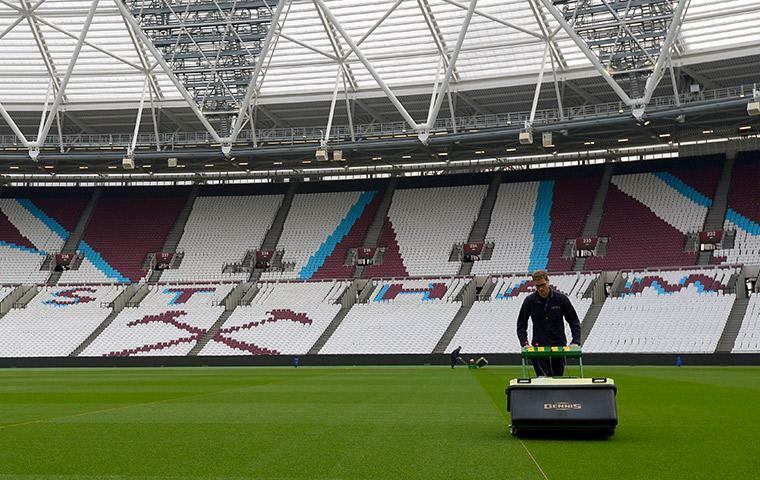 •The surrounding gaudy green Astro turf to be removed and replaced with claret or blue at the expense of WHU. •A possible solution for the Stadium naming rights would be to divide it so West Ham will be free to find their own sponsor say Vodaphone and would be known as the Vodaphone Arena when the stadium is being used for football only. E20 to find their own sponsor name and will be called the …… Arena when being used for athletics, rugby, concerts etc! If this is not a workable solution then a deal needs to be struck where WHU get a considerably larger share of the profits gained from a single naming rights partner. •WHU to pay the council to take control of the access bridges on match days only and some local businesses from UP to be invited to pitch their stalls. How lovely for example would it be to see a Nathan’s pie and mash stall? •The main access bridge to be made “West Ham” eg ex players and legends remembered/flags etc (as promised)along with a new statue of the 3 x World Cup winners, the original to remain at Upton Park…..
To summarise I understand some of these suggestions may not be feasible others may well be, other than the retractable seating most of my suggestions with good negotiations between all parties could be in place before the start of next season. What you may have noticed is that I’m attempting to separate WHU from the stadium owners/operators but at the same time generating extra turnover for both parties, appeasing both WHU fans/owners and ultimately the government. I like the sound of all these very pragmatic suggestions.